View, View, View, Gorgeous Long Range Mountain Views! Gorgeous long range views from atop Mary King Mountain near friendly Murphy, North Carolina. 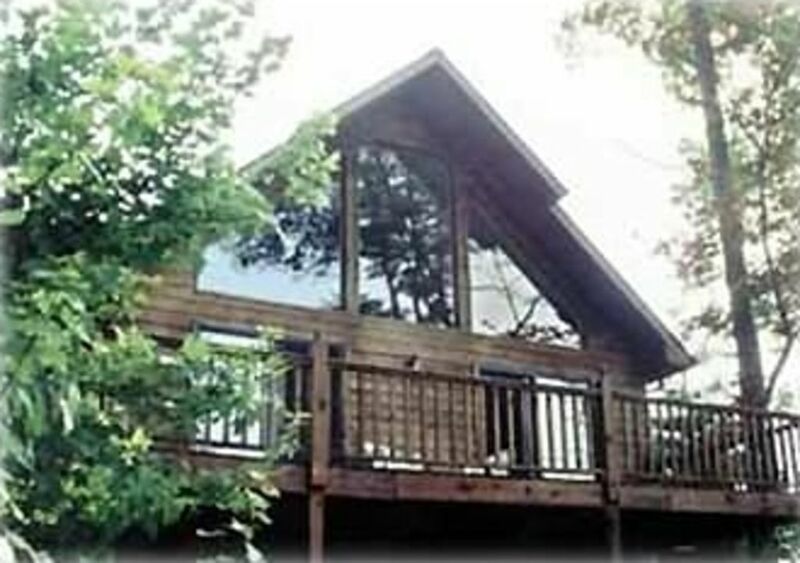 Two bedroom, two bath Chalet has loft - wake up to natures beauty. 15 minutes to town, 20 minutes to Ingles Supermarket or Wal Mart. Day trips to Smoky Mountain National Park, Nantahala Gorge, Ocoee River, Frankin-Cashiers area, Chattanooga, Atlanta, Asheville, Pigeon Forge, etc., etc. Just Opened Summer 2015 --> Valley River Casino --> Past Wal-Mart on 74/19 just minutes outside of town. Lots of big name entertainment. Call for brochure and availability. Both baths are shower/tub combinations. Timer strip heaters in both bathrooms. Local calls only. You must use a calling card for land line long distance calling. Air Conditioner/Heat Pump replaced with a new Trane SEER 16 Compressor and AirHandler in July 2018. We have a TP-Link Router and Satellite based WiFi internet service. This seems fairly reliable but does have an occasional outage. ATT and Verizon both have cellular service in the area. We don't stock any pantry items. There will usually be some paper products there. Large wrap around deck for great views. Several local golf courses open to the public. Central Air/Heat, Satellite DISH Network, Satellite based WiFi, Charcoal BBQ, Stone gas log fireplace, Open outside deck, Lots of window area to enjoy the view. Antique Shopping, Whitewater sports, Numerous waterfalls, Scenic Mountain Railroad, John C, Campbell Folk School, Lake Hiawassee, Lake Chatuge, Lake Nottely, Nantahala River, Ocoee River ....Now Open --> Valley River Casino ! !